1) What elements make up life? All matter is made up of atoms (AKA elements) which are put together to make molecules. The most imporatnt elements found in living things is Carbon, Hydrogen, Oxygen, and Nitrogen. 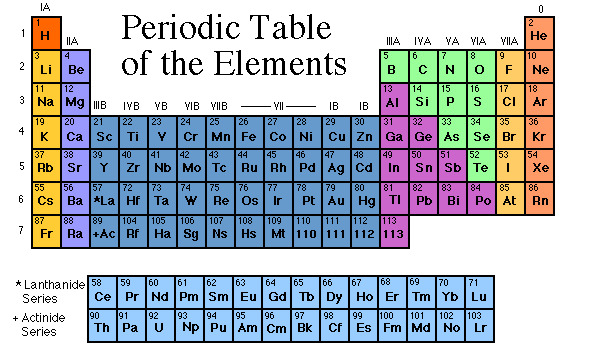 All know elements in the universe are found on the Periodic Table of Elements. 2) How is the periodic table organized? Francis Crick and James Watson discovered the shape of DNA along with Maurice Wilkins. 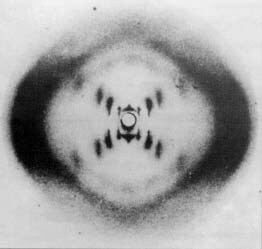 They could not have done it without the help of Rosline Franklin's x-ray crystalography picture that helped them uncover the structure of DNA. 4) How is DNA put together and what are the parts? A and T are always bonded together and C and G are always bonded together. 6) What is the relationship between atoms, molecules, DNA, Chromosomes, and Genes? Atoms are put together to make molecules, DNA is a molecule, click on the animation below to learn more about this relationship. Hit refresh in your wed browser to see it again. 7) What is the difference between sexual and asexual reproduction? What are Traits? How do you get your traits? Traits are characteristics, or what an organism is like. 1. Group Traits: Traits that all individuals in the same species have. For example, all humans have 2 eyes, 2 legs, and 2 arms. These traits are controled by DNA and what makes one organisms different from another. 2. Inherited Traits: Traits that you get from your mom and dad. These traits are different for every individual. For example, eye color, skin color, hair color, ablity to roll your tounge, color blindness and some diseases like breast cancer. These traits are controled by DNA. 3. Aquired Traits: Traits that you get from your lifestyle choices and the environment. For example, if you have blue hair because you dyed it. Also, some diseases such as lung cancer you can get because you choose to smoke. These traits are NOT controled by your DNA. How do genes control traits? How does medicine use genes to cure and prevent diseases? How big are objects that make up living things?